The Gunsmith is getting a major overhaul in The Taken King DLC, providing players with a chance to earn reputation and even pre-purchase weapons which arrive on a weekly basis. This further increases the Gumsmith's usefulness following his atrocious start to the Destiny franchise. 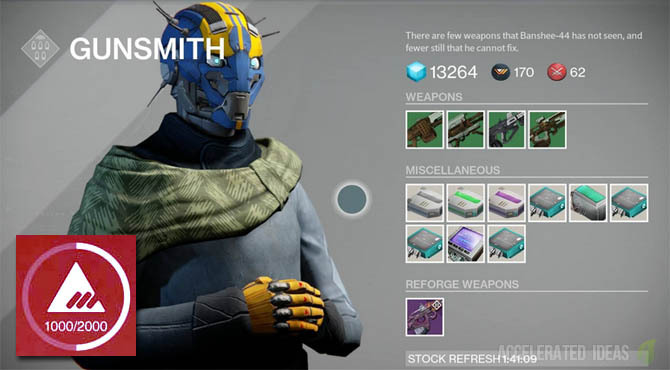 Prior to The Taken King, the Gunsmith was a rather dull and useless little fellow. Offering some sad green and sometimes blue weapons for a hefty price. The only time he actually became of any use was when he sold rare fusion rifles to help us complete the Exotic bounty. If only he didn't do it in the middle of the night!! After the House of Wolves DLC, the Gunsmith did gain a rather impressive perk re-roll feature which increased his standing considerably, but these new additions in TTK are sure to make him one of the more memorable characters in the Tower for a long time to come. Known to most Guardians as Banshee, the Gunsmith now has a reputation meter, similar to other Tower characters such as the Cryptarch and Class Vendors. 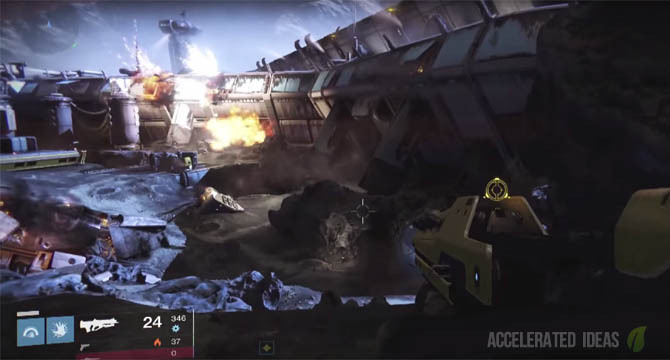 Players can engage in prototype testing, which consists of taking (borrowing) one of Banshee's prototype weapons and completing a mini challenge out in the field. Of course we all know this is a dressed up version of Bounties but the reputation achieved from Banshee provides additional and unique bonuses. Unlike bounties though, the actual challenge is built into the prototype weapon, meaning that you must use the prototype in order to complete it. They range from anything from shooting Hive on the Dreadnaught to getting headshots in the Crucible. Every prototype will be different and players can consume as many of these prototype challenges as they have space for in their inventory (bounty slots). Once you've achieved a high enough reputation level with Banshee, you can choose to spend glimmer in return for a random Legendary weapon. This weapon will arrive on a Wednesday (one day after reset) and you won't know what weapon you've got until either Banshee or the Postmaster tells you. It's kind of like the Crytparch but with a guaranteed chance of a Legendary weapon rather than a useless piece of junk. Combine this with the improved RNG in The Taken King and it's likely that the Armsday purchase will more likely be something new every time rather than the same Legendary over and over again. No word on the exact cost of the Armsday purchase yet, but I guess it'll be hefty if the reward is a Legendary weapon. Don't make the mistake of thinking that the weapon will be a Year 2 weapon though, it could easily be an original Legendary with a worthless attack stat.